Andy Murray once again froze on the biggest stage Sunday but instead of shedding tears as he did last year he simply shrugged off his failure to end 75 years of British Grand Slam hurt. 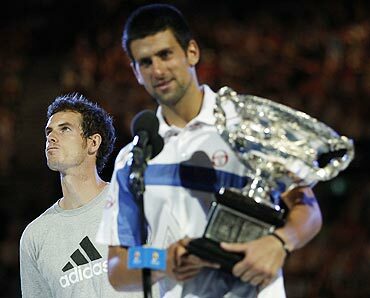 Murray embraced Novak Djokovic at the net after a 6-4 6-2 6-3 humbling by the Serb in the Australian Open final but then echoed the defeatist body language he had displayed in the match by saying he would not lose any sleep over his latest flop. "It's better than it was last year," shrugged the fifth seed, who was reduced to tears after being beaten by Roger Federer in last year's Melbourne final. "It was obviously tough, disappointing. You know, I thought Novak played unbelievably well. Yeah, it's tough, but I've got to deal with it." 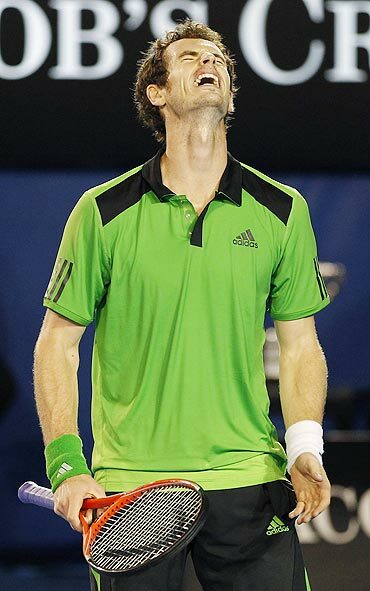 Murray has now lost three major finals, failing to win a set in any, and Britain's wait for a first men's Grand Slam singles champion since Fred Perry in 1936 continues after a display in which the Scot only became animated when yelling at his box to "Be quiet." "Against Novak you need to be firing on all cylinders," said Murray, offering the usual platitudes in a monotone which screamed 'Get me out of here'. He went on to say a Grand Slam title might not be the be all and end all for him. "It's not something I lose sleep over at night," said the 23-year-old Scot, also thrashed by Federer in the 2008 US Open final. "It's going to be tough for a few days. I want to try and win one, of course. But if it doesn't happen, it doesn't happen. "I take tennis very seriously. But I love my life away from tennis as well. This year, compared with last, I'm very, very happy off the court. "I'm enjoying myself. There's other things to look forward to." There was little enjoyment evident during a complete pasting by third seed Djokovic, who was still in the zone after blowing away Federer in the semi-finals. Whereas Djokovic pumped his fists and bellowed to the heavens to fire himself up, Murray appeared to flatline in a final which turned into a no-contest. "You always have to try and believe," said Murray, whose hunched shoulders and twisted facial expressions suggested he knew he was already beaten. "I'm going to need to improve." 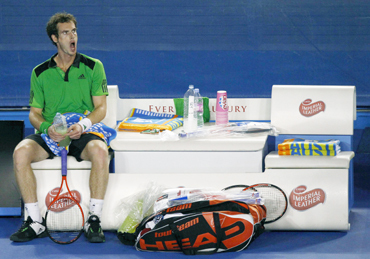 Djokovic better summed up Murray's inner turmoil. "In some ways it is a mental issue when you're playing the finals of a Grand Slam, being so close to winning a title," he said, having sipped champagne from the winner's trophy. "Every time you get there, you want to win it badly, but some things go wrong. You're thinking too much. You're worrying too much in your head. It's a mental battle, definitely." 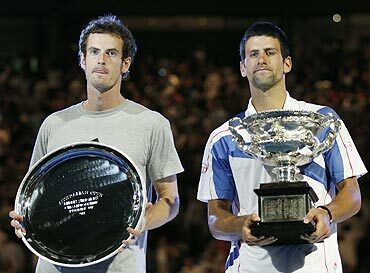 Djokovic tipped Murray to eventually break his duck in the four major tournaments. "He has everything that it takes to become a Grand Slam champion," he said. "I'm sure that very soon he will be. "He's been in finals three times and he just needs to make that final step. Of course, it's not easy. "You could see his struggle and frustrations tonight, because he felt his chance to win a first Grand Slam trophy tonight. But it's a learning process."